I must have come up with a hundred reasons why I shouldn’t be taking this gap year. You know, that Mr Logic I’m here to protect you and keep you safe voice inside your head. The one that keeps feeding your head with sensible reasons not to do things. What for 12 months? Travelling solo. Nah, you’re too old. What if you got ill. Had a heart attack. No one would have a clue where you were. But why? You’ve got a comfortable life here in Perth. And then those middle of the night ones when Mr Logic I’m here to protect you wakes you up. “What if someone kidnaps you? It happens you know”. But for the first time in my life, the gut feeling kept coming through loud and clear. Every time Mr Logic I need to protect you came up with yet another don’t be so stupid reason, Gut feeling would say just shut up. Get over it. You’re going. And that’s what I did. Twelve months later, twenty three countries and one hundred and twenty two different places of abode. And along with it so many amazing experiences. I wanted this trip to be something completely different. To break away from normal routines. As such no planning. No goals, no deadlines. Just take each day of the next twelve months as I went. And that’s what I did. All I booked was one around the world ticket with just three main stop overs, three to four months apart. Nothing more planned or booked than that. And I wanted to step outside the comfort zone. If it felt uncomfortable, I wanted to push myself to do it. So it was the first time I solo travelled and first time backpacking, certainly for any length of time. First time I tried surfing, white water rafting, spear fishing, swimming in the middle of the ocean at night being lit up with glowing plankton, crawled up into the top bunk in a hostel mixed dormitory full of backpackers younger than my kids, slept in a hammock, slept overnight stretched out on an airport lounge (thank you Zurich Airport), learnt a new language (at least to an advanced kindergarten diploma level), home stayed in non English speaking homes, took salsa classes while being coached by a sympathetic teacher and an interpreter, gate crashed a huge wedding like family function… loved their whisky, climbed up volcanoes, trekked up to five thousand metres and experienced the affects of high altitude, had my longest bike ride of over two hundred kilometres, swam with giant turtles, shared a park bench with a huge sea lion… I actually saw the seat first, found myself stranded on an island in the middle of the Pacific with not even enough money to get off the island. And on another occasion discovered I was literally penniless in the middle of nowhere in a foreign country, no wallet, no money, no credit cards. Slept in every conceivable form of bed from hostels, guest houses, dormitories, hotels, bamboo huts, homestays, slept on the floor, in a tent in the middle of a jungle, a hammock, a Buddhist monastery, in a swag, overnighted on busses. Stayed anywhere from one night to a couple weeks. If I didn’t like a place I moved on. If I liked it I stayed. Travelled by just about every form of transport imaginable. From plush busses, busses with a full length bed, to busses with as good as no doors, crammed into chicken busses along with bums and armpits jammed in your face, squeezed into mini busses going for one side of a country to another, hung on for dear life on the back of a pickup taxi truck while peering down the edge of a mountain road, ridden in a bone shaking horse and cart, rode a camel, spent two days riding the rapids down a river in the middle of a jungle, went fishing by helicopter, zipped around a countryside of ancient temples on an ebike… oh and then had to push the thing home in the middle of the night because the battery went flat, sped along the highway on the back of a what looked liked it was still being repaired motor bike, meanwhile fretting if my travel insurance was up to date, ridden a push bike barefoot around city streets at night, no lights (I mean everyone else was doing it), taken train trips that rock so much you’d swear you’re on an amusement park ride, and in trains where you are constantly being flicked in the face by trees and sticks as the train carves its way through the jungle forest, taken a boat through the Amazon jungle (and survived swimming in the middle of the Amazon without being taken out by piranhas or anacondas). And all this while very much being blessed with not once falling ill. Even with all the wide and varied and foreign foods I fronted up to. With all the countries visited, including those I was warned not to venture into, and with all the extensive walking I did, not once feeling threatened or in danger. And of course meeting so many inspiring and enjoyable people along the way. Because it’s the people who create the memories of travel. Thank you for your friendship. To the many young people, this confident young generation. Our age group have a serious bit of catching up to do to enjoy what you people are out there experiencing right now. Well ok, so I was wrong…. You young people. Always taking off on a gap year. Why, you should be more responsible and go get a job like the rest of us. But no, good on you. You’re right. Every young person should be encouraged to do just that. And importantly I want to take this opportunity to thank you. Thank you for being part of this journey. I hope you have enjoyed and gained, even if in just a small way, something out of the experiences I enjoyed sharing with you along the way. I can sincerely say, it has meant a lot to me having you with me on this journey. Particularly your feedback and comments. To each of my children and their families for their support of me taking on this little venture and with your regular contact. Along with people like you, I very much mean it, it would not have been the same without you. Thank you. I hope through sharing this little journey with you, that if you feel so inclined, it may have also inspired you. As I found, the biggest obstacle we have, in fact to do anything beyond our normal routines, is that Mr Logic I’m here to protect you voice inside our heads. I hope your gut feeling also rises to the occasion and tells your Mr sensible Logic to simply shut up for a change so you can go do it. Of course it’s dangerous out there. Maybe I was lucky. But I think it’s far more dangerous regretting not doing it. If sharing this journey with you has inspired you in just a small way, I’m very delighted. Hey let’s know if perhaps I can help. My Senior Gap Year. It’s been one hell of a ride. Thank you for being a part of the journey. 8 comments On Thank you. It’s been one hell of a journey! Oh no…. please tell me it not so ,that this gap year has come to an end. I have loved following your journey. Your posts have been such a joy to read and so much so that there have been times with your descriptive posts if I closed my eyes I was almost there .. almost! Some gifts in life are wrapped in new glossy paper, and a neatly tied, pretty bow. This one was scarcely held together with patchworkk scraps and barely there string. Yet it was the present everyone wanted to open, because its contents begged imagination, curiousity and the unknown. 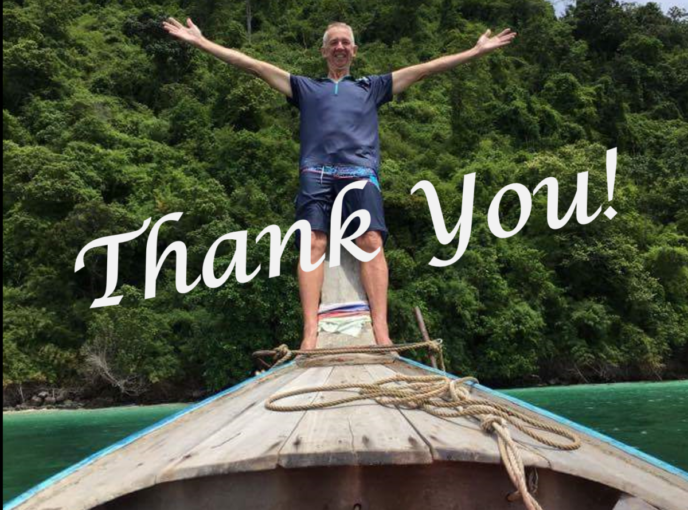 Thank you, Chris, for taking us on a wild adventure which was unfamiliar, exiting and filled with delightful surprises. Thank you for the unfancy, the unpredictable, the unbelievable. But most of all, thank you for the humanity, honesty and altruism. You are one of a kind, dear friend.. Your next chapter eagerly awaits. Gratulation to your long trip. I followed your stories (not always easy to read for an “low vocabulary Austrian”) and was sometimes astonished aout your aims. Thanks, you are healthy back to Perth, Susi and I visit our friends in Perth from Sept 21st to mid of Oktober. Perhaps we can meet us in WA. Great to hear from you Herbert the biker! I’ll email you. Maybe we can organise a ride around beautiful Perth. Hi Chris,just finished reading all about your adventures,WOW!!!! !.What a fantastic year.Glad your home safe and sound.Love to shake your hand next time I see you at the Swan Yacht Club,and by the way I just threw Mrs Sensible Logic out the window.We are travelling through the Panama Canal and various other places in 2 weeks. !can’t wait to check out those locks. Good to hear Mrs Sensible Logic has been also shown the window!